Do you need a complete makeover? 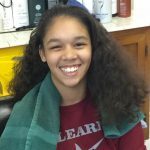 There are many reasons you may want or need a perm. The idea that perms are just for people with long straight hair or short with frizzy curls is of the past. This isn’t the 1920’s nor the 1980’s. This is a new century! They can be whatever you want from tight curls to big bouncy ringlets at any length of hair. It is time to get rid of the flat hair and trade it in for the modern natural looking curls and loose waves that not only look pretty but are easy to maintain. Styles of today need bounce and texture. 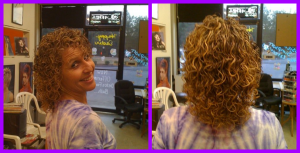 Those who are blessed with natural curly hair can add volume and controllability with a perm. Curls have always been classical and always will be. But you want to wear it straight sometimes? Just use your flat iron. So say ”hello” to the stylish contemporary hairstyles for permed hair! 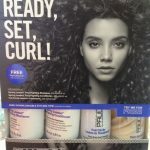 The C urls Line from Paul Mitchell are great products for both permed and natural curly hair. The frizz-fighting shampoo and conditioners will tame your hair. The Twirl Around is a crunch free curl definer. The Ultimate Wave is a beachy texture cream-gel. You can be assured the these products are a wonderful finish for your beautiful hair. These products are always available at Bruce’s. Are you tired of rolling your hair every day? This may be just for you! When you are talking about wanting “just body” you will get just loose curls and gentle waves. This is great if you want to scrunch or for a messy look. It can be done on any length or texture of hair. The natural loose curls are great for adding volume to thin fine hair. If you have medium or coarse texture hair it softens the look of your hairstyle. If your hairstyle is gone by the time you get to where you were going, this will solve that problem. Not sure if curls are what you are looking for, then this is the perfect answer and an easy introductions to curls. It is simple, volumising perms adds more volume and curl than just a body wave. The more curls, the more volume! With today’s products you can give your curls definition and texture without being stiff or crunchy. This perm can be as easy or as difficult as you make it. The term texture means that your hair is either fine, medium or coarse. 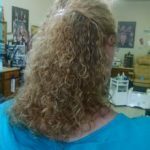 Texturizing is just a way to manage curls whether it be with a cut, products or a type of perm. With a perm you can either add more curl or less curl. If you want a more natural curl then a multi-textured perm is the answer for you. It is created by using different sizes of rods to keep the final look from looking too uniform. Spiral perms are usually given on long hair. The cascading curls frame the face beautifully with corkscrew curls. How tight the curls are depends on the size of rods the hair is rolled on. 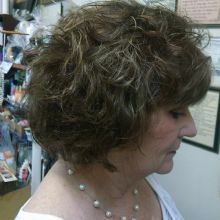 It can be done on short hair but the result is usually very tight curls which can be achieved with just a regular perm. This is definitely a texturizing perm. Rods are rolled vertically rather than horizontal. The perm takes at least twice as long because there is 2 to 3 rods in place of one rod rolled horizontally. Styling requires little effort. Apply your choice of styling products and wrap around two fingers and twist until you reach the end, dry and shake. You still can change the look as easy with curling iron or hot rollers for a more relaxed fluffy curls. Most perms are designed to add more curl and\or give you more controllability to your hair. A chemical relaxer is designed to remove curl. You have the option of how straight you want your hair. You may consider leaving some wave so it will still have some bounce to it and to be able to hold some curl. Just remember if you want very straight hair, it will not be able to hold much of a curl. So be sure that is what you want. There are different strengths of formula for your type of hair whether it be Ethnic or Caucasian or a little of both. Let us decide. Many factors determine which formula to use such as texture or has it been color treated in any way. It is recommended getting deep conditioning treatment on chemically relaxed hair. While a chemical relaxer helps to reduce frizz on curly hair you should first try getting a Keratriplex Treatment. The results won’t be as dramatic as the relaxer, but you’ll save time, money and have really healthy hair. It just might be the perfect answer.